In 1/72 scale there are the models of Heller and Matchbox of the nineteen seventies and eighties. The Matchbox model was a bit basic but I liked it nevertheless at the time, but it has long gone to model "eternity". 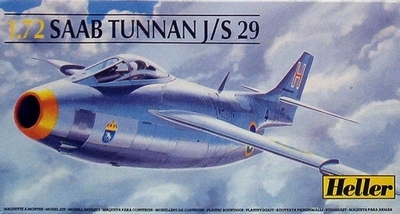 Tarangus released in 2013 a brand new kit as well in 1/72 (and later 1/48). 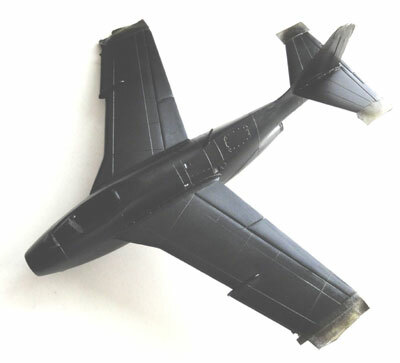 The Heller model is a bit finer than the Matchbox offering and was first released in 1978. Several re-issues appeared with new boxes and decals. 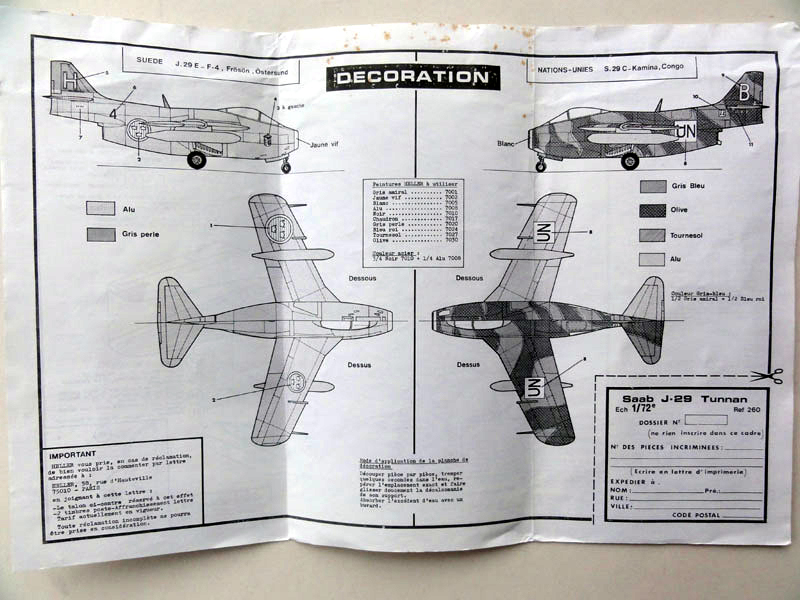 (It even was released by Airfix when HUMBROL owned both Heller and Airfix). 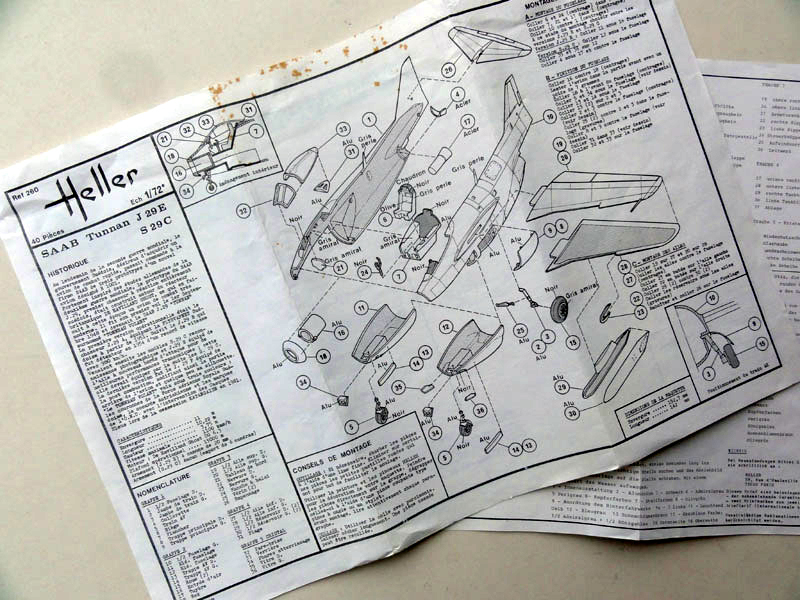 The Heller kit (this release #260 ) has about 35 lighter grey parts and 5 clear parts. 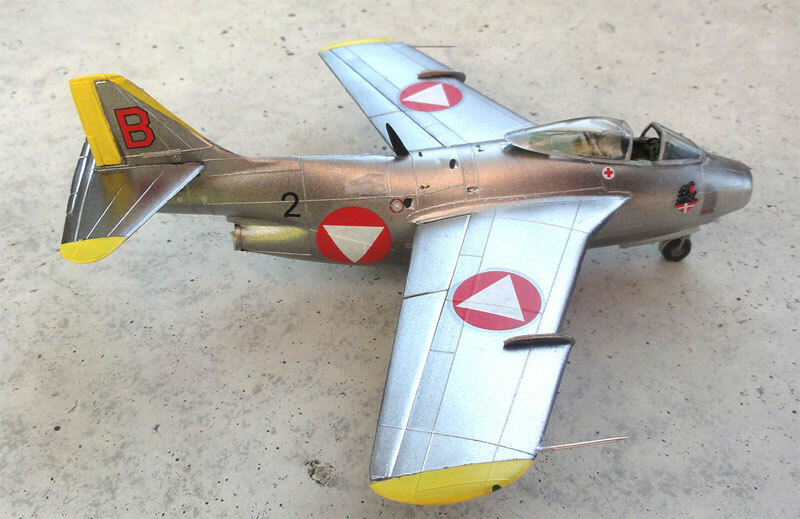 It depicts a J29F with the outboard wing leading edge extension and wing fences. 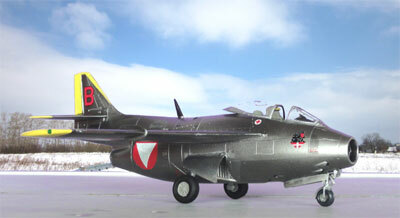 Also there is a nose choice to make a reconnaissance S29C with a seperate lower nose section. 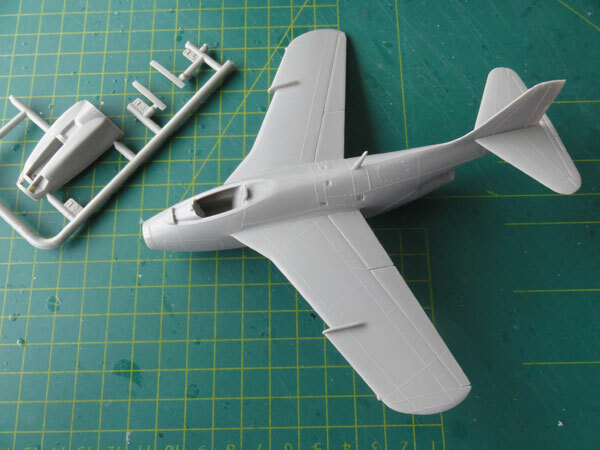 The kit length and wing span look OK and the wing type is the later final wing. The panellines are not recessed but finely raised. The cockpit is a tub with a reasonable typical J29 ejection seat. 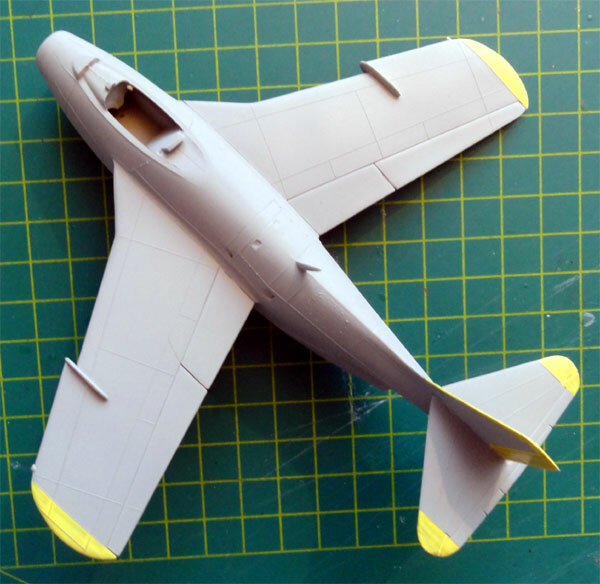 Two underwing tanks and pylons are provided and the gear bays can be set open. 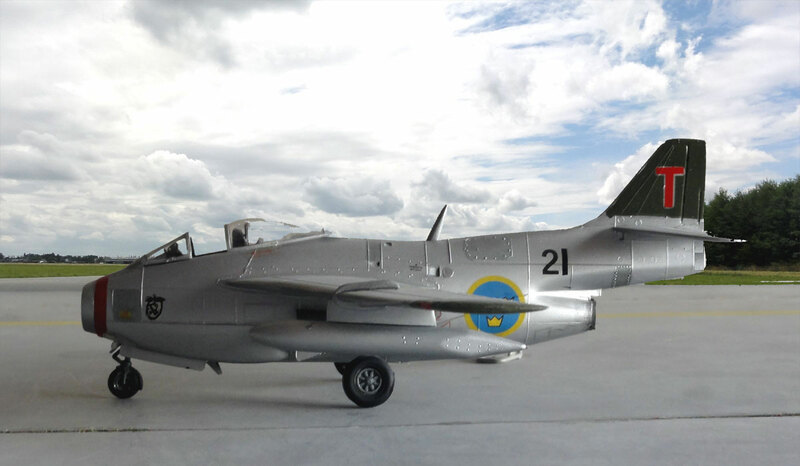 (2) Swedish Air Force S29C as used deployed by Swedis AF for a United Nations mission 1961 at Katanga/ Congo. 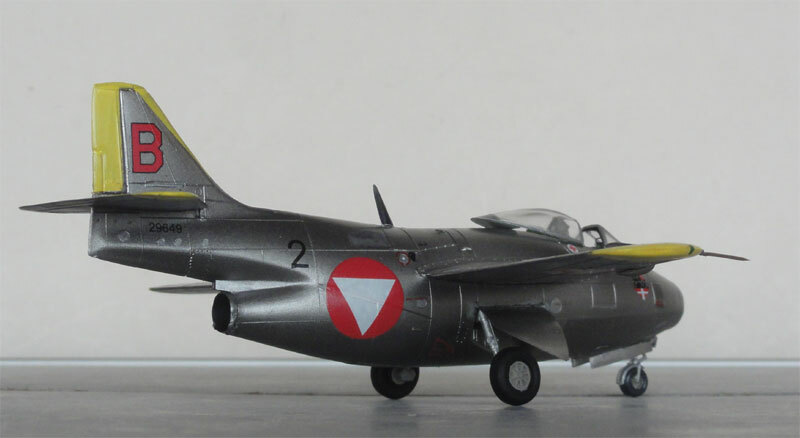 The kit decals are simple but not too bad as very limited stencilling looks applicable for the J29. 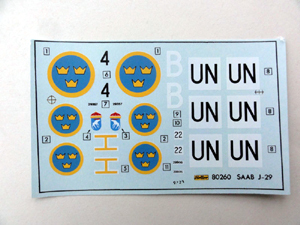 Several after market parts also were released like a PAVLA detail set and various decal sheets like the nice one from Print Scale. I also had several of these. 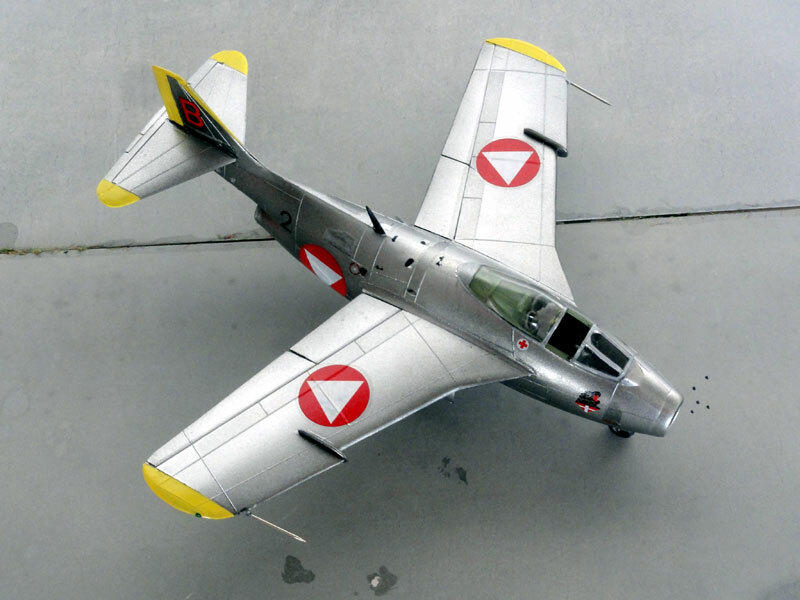 This is a nice kit from Heller and it was quickly assembled. I added a little sprue inside the wheel bays to suggest hydraulics. I did my best not to sand off the raised panellines and fortunately only limited filler was needed at the nose. The cockpit interior was a sort of light green. 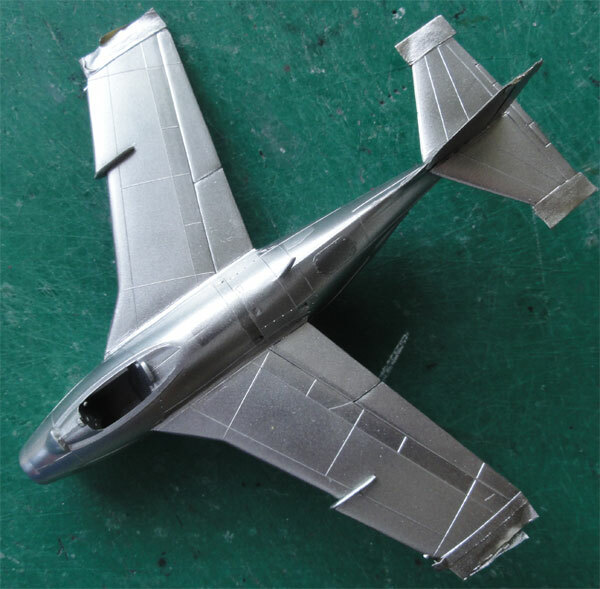 The lower nose section does require a bit outlining and filling. But assembly is straight forward but do not forget to add substantial nose ballast to prevent tail sitting. 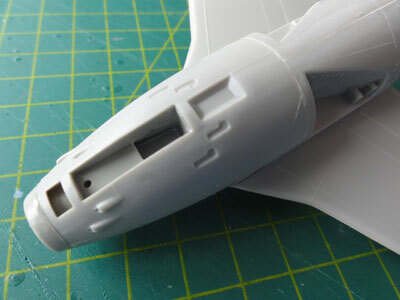 Also, fit a small piece of card at the landing light recess in the lower nose. The exhaust pipe lower reflector plate is not often fitted so check photo's. 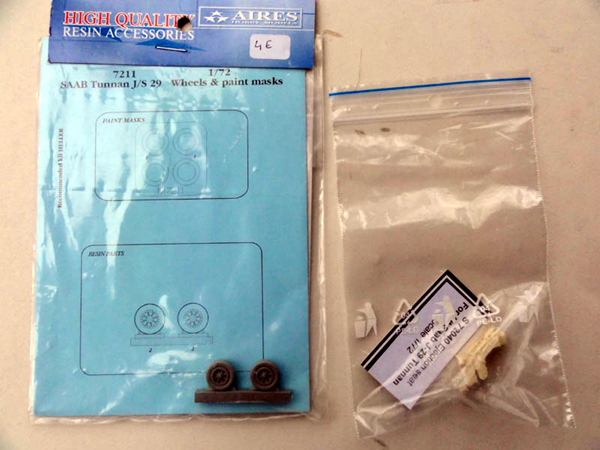 Two Heller kits were made, one of these over 15 years ago. 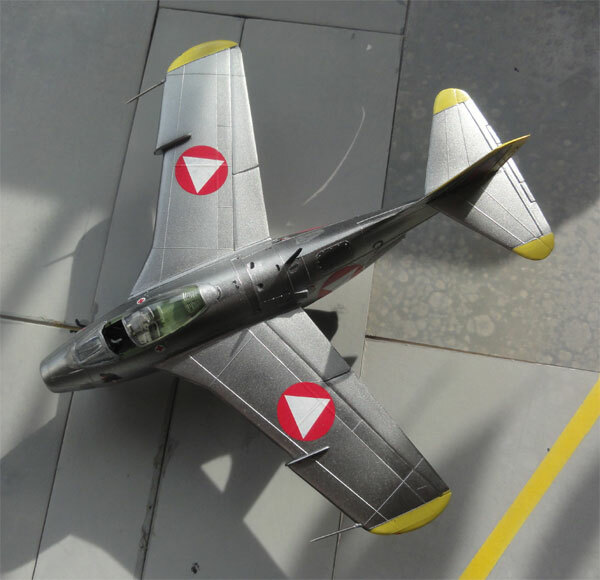 One kit was made recently as for the Austrian Air Force. 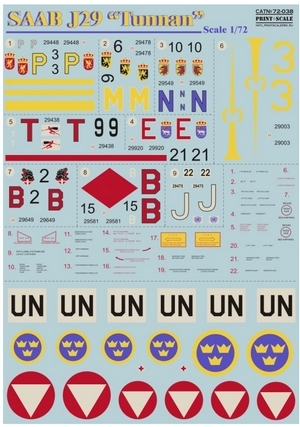 For this Heller kit, decals were used of the Print Scale 72-038 1/72 scale decalsheet. 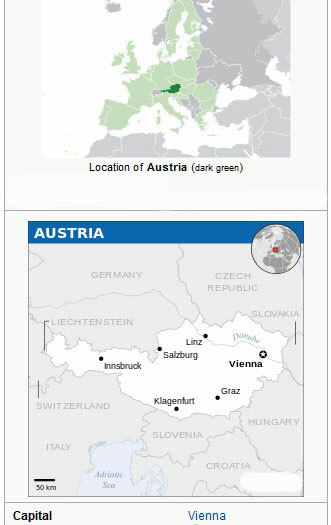 (NOTE that the old Matchbox kit also had Austria scheme decals). 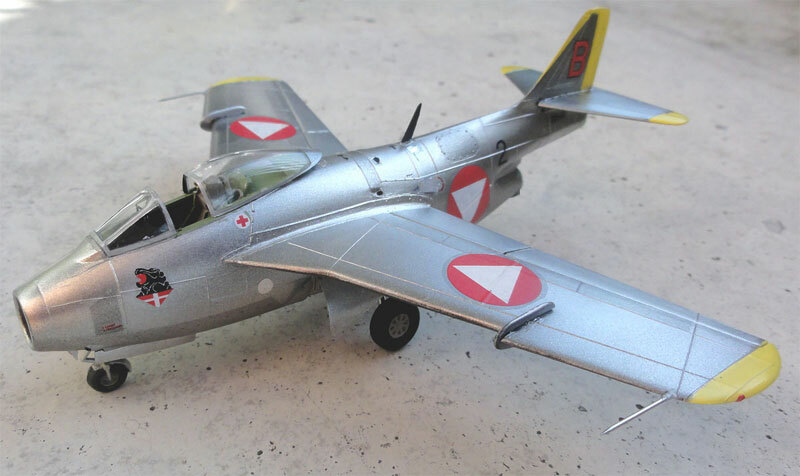 This Oesterreichische Tunnan is of the 2nd Jagdbomber Staffel with serial 29649 and tail code B. Used in the nineteen sixties, it has a metal finish with a few different sheenes on some panels (so not gloss aluminium paint nor high speed silver paint). Also, it has yellow details at the wing tips. 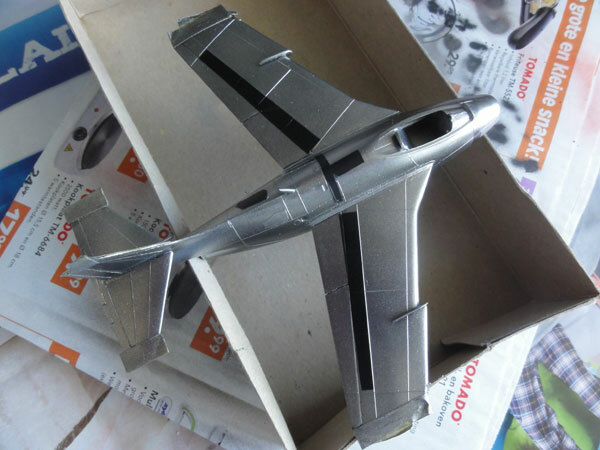 The model got base coat of grey to check for any errors. As noted before, only a bit of filler was needed. Next yellow was airbrushed first, using Revell Aqua 12 "gelb" acryllic. After these dried, these were masked off. 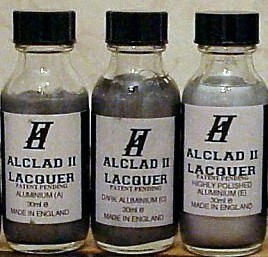 Next, the ALCLAD II system was used for the metal finish. First base gloss black undercoat was airbrushed. Ensure it is gloss. (Note: if you use the special black ALCLAD lacquer black coat, ensure more than 1 week drying time! It dries slowly). I had and used gloss black acryllic paint. The special trick was used to get some different looking panels. 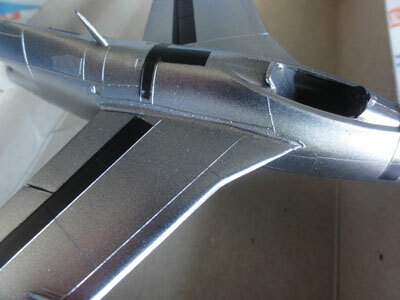 Some were now masked off with tape and a first ALCLAD airframe aluminium ALC-105 airbrushed. The smaller parts were also airbrushed like the doors. The decals went on fine. 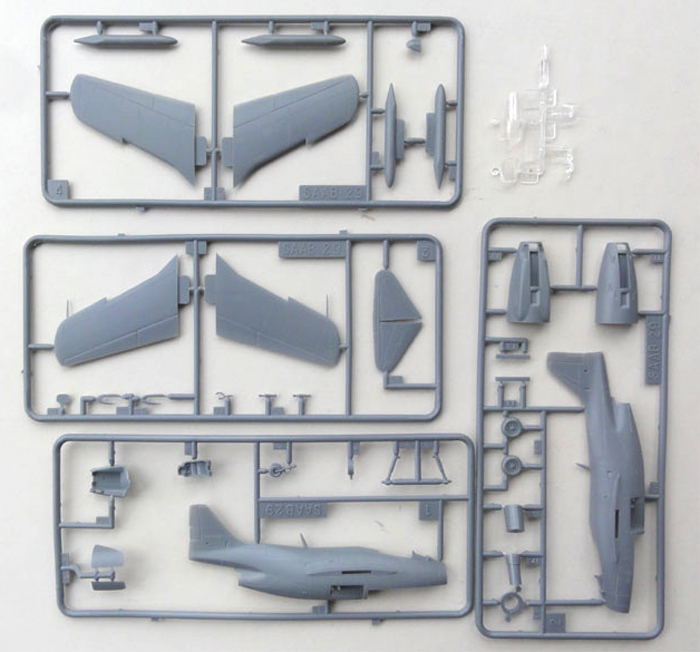 Now the remaining parts like the undercarriage and doors were added. 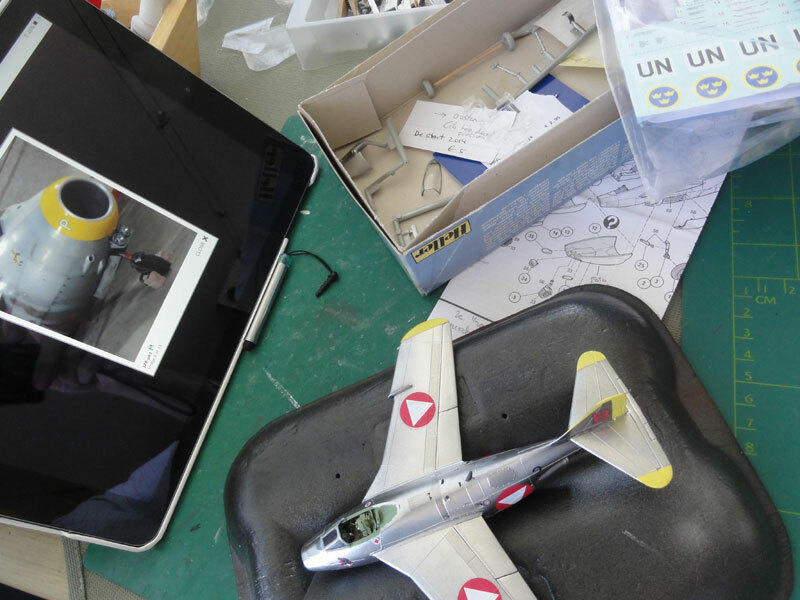 Two metal pitot tubes were added made from metal needles. A final gloss coat was put on using Johnson Future/ Pledge, this protects the decals and given an even gloss sheen. Apply the Johnson coat in several thin layers and not too thick. That completed this nice model. 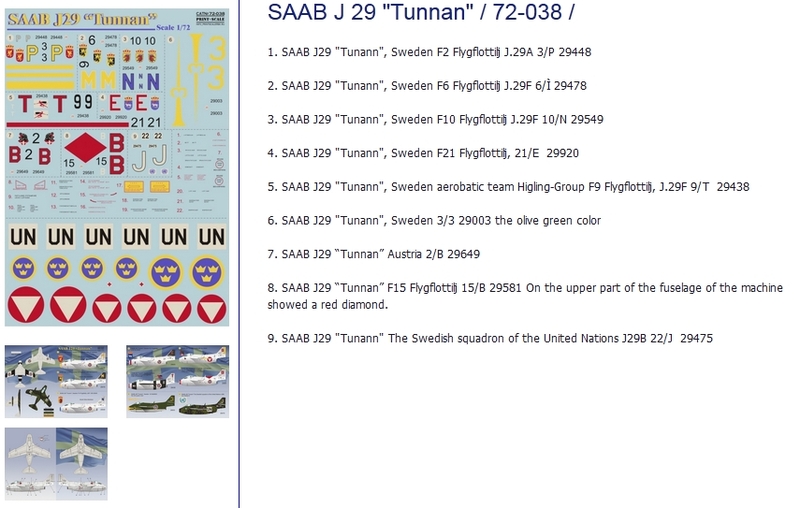 The second older Tunnan model was already in the collection for over 15 years. 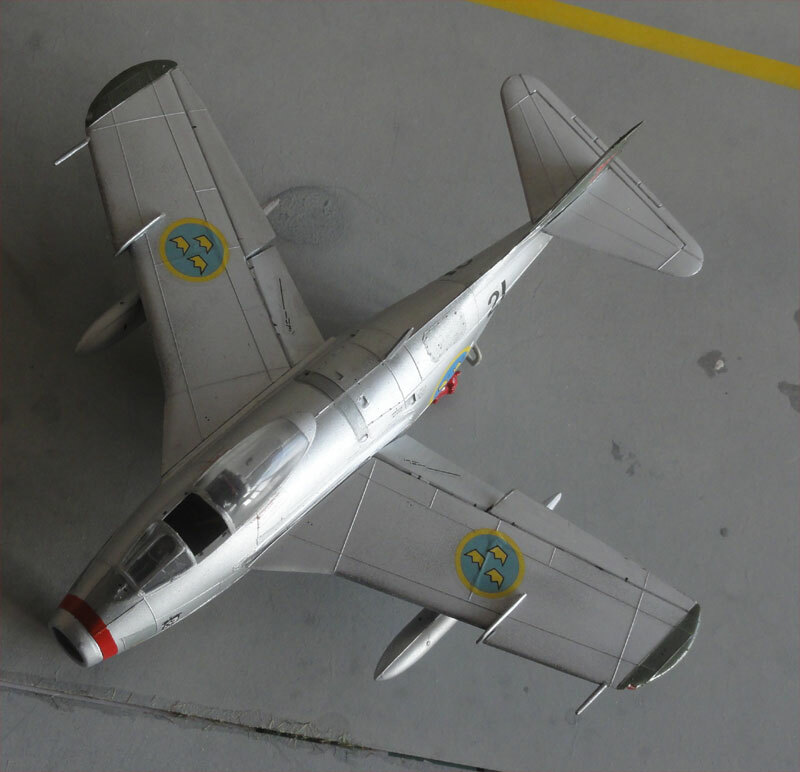 This Heller kit was made as a Swedish Air Force J29F of the "flygvapen" unit F21 and also used for the air demonstration. (I do not know the name of this demo team, it is not the "flying barrels" as they had a different scheme). The green tail was simply masked off at the time. The nose marking was hand painted. The rest of decals came from the kit. 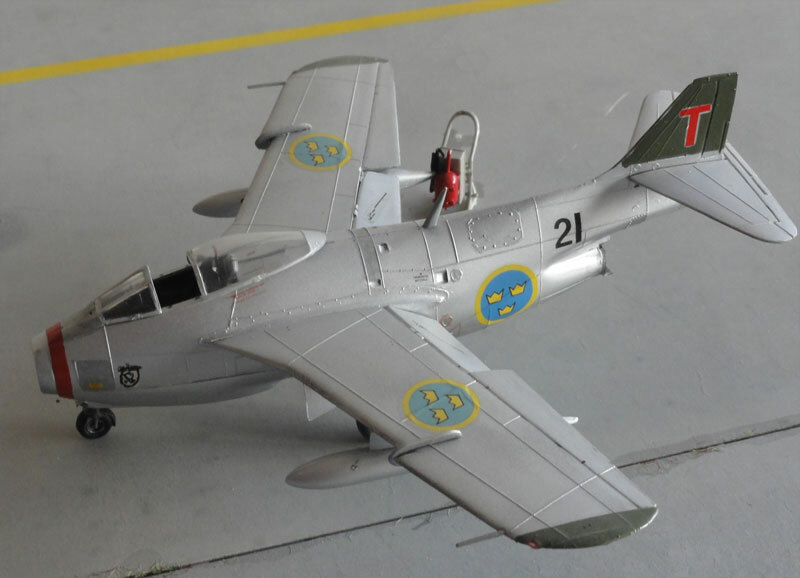 (1) J29, Aircraft in Detail, article by Stig Jarlevik, Scale Aircraft Modelling (year unknown, in the eighties?) 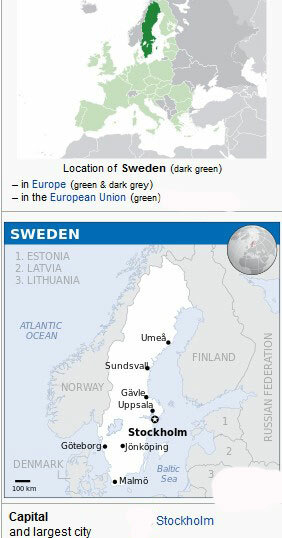 (founded by the late Alan W. Hall). 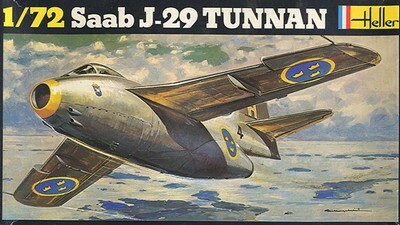 (4) Various articles about Saab J29 in magazines like Air International, Aircraft Illustrated etc etc.